Judge (Ret.) Mark Painter, now of counsel at HelmerMartins, attended the April 2018, monthly meeting of Clarity in London. Clarity is an international group of lawyers and judges who believe in writing in plain English. The topic for the morning was “Plain language in the USA: forward strides or stuck in the mud?” by Professor Mark Cooney of Western Michigan University Thomas Cooley Law School. Professor Cooney is a champion of the legal plain language movement. Judge Painter was in London with his wife, Sue Ann, on holiday, and it was fortuitous that the Clarity meeting coincided with the trip. It was held in the Guildhall in the old City area. The lecture traced the plain language legal movement in the United States, and concluded that some professors, and some judges write in plain English. But that the biggest laggards, and those wedded to the “old” system of legal writing, were the practitioners. 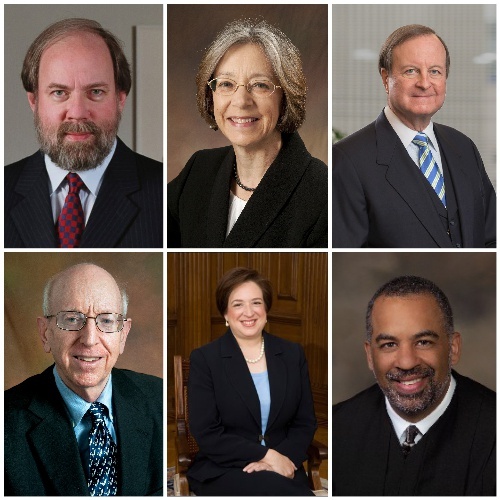 The biggest surprise for Judge Painter was when Professor Cooney put up a slide of the “best” judicial writers in the United States, shown here (Judge Painter is top right): The others (Clockwise from top left) are Judge Frank Easterbrook (U.S 7th Cir), Diane Wood (U.S. 7th Cir), Painter, Judge Kevin Ross (Minn. Ct of App), Justice Elena Kagan (U.S. Supreme Court), and Richard Posner (U.S. 7th Cir). “It was a total surprise, and of course a great honor, to be listed among the six best judicial writers, even though I am now retired from that endeavor,” Painter said upon his return from London. Long active in the plain language movement, Judge Painter has taught more than 250 seminars to lawyers and judges all over the United States. He has even lectured abroad in Montreal and in Kuala Lumpur and Penang, Malaysia. He served for exactly 30 years as a judge (1982–2012) before joining our firm. The fifth edition of Judge Painter’s book, The Legal Writer: 40 Rules for the Art of Legal Writing, is scheduled for publication in July. For more information, or to discuss a potential case with us, please contact us.